This classic timepiece by Diesel features a stainless steel case and strap. A black dial, precise quartz movement and a water-resistance level of up to 30 meters finish this fine timepiece. 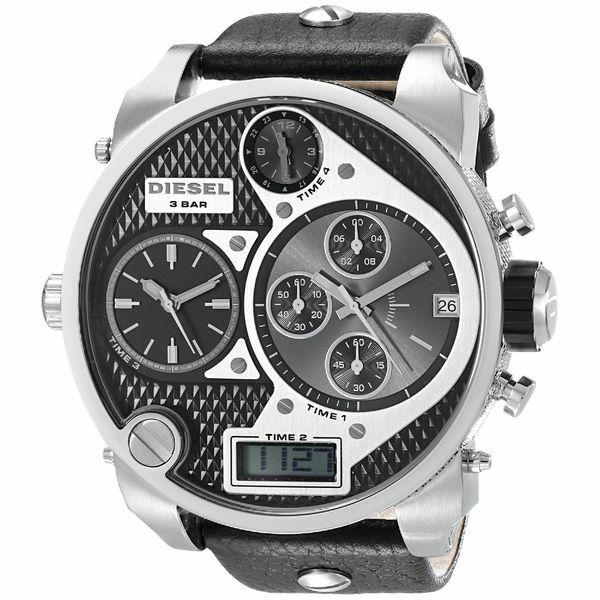 If you are into.big watches, this one is for you. We first saw it on.a trip in Mexico and fell in love. It's about half the price on here as compared to the cost on.vacation. My brother loved the style and sophistication of this watch, he is very satisfied and pleased with how it goes together with the style of clothing he wears. Lovely watch, at a great price! I bought it for my husband and he really loves wearing it. Nice modern big faced watch. He's received a ton of compliments. Great watch . Looks and fits awesome. Bday gift for my husband...he loves it! The look, size and great price! My husband likes the diesel watches. "Im interested in model DZ7221 but I cant find it on your site. Do you carry it and if so how much is it?" Thank you for your question! Unfortunately, we do not carry that model on our site at this time. Please let me know if you have any further questions, and thank you for shopping with us!